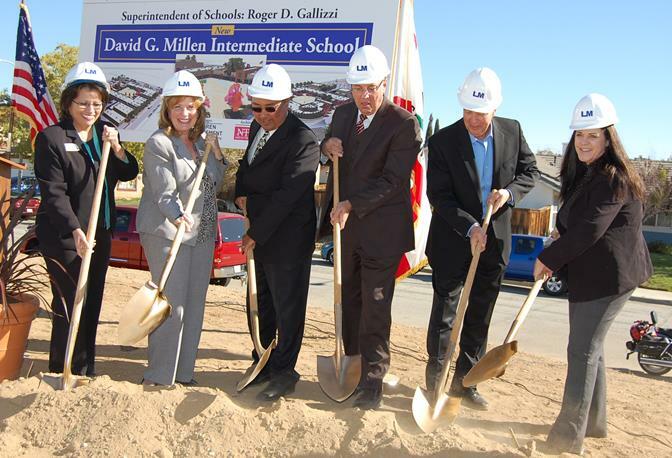 (L to R) Sandy Corrales Eneix, Carol Stanford, Bob Rodrigo, Norm Hickling, Jim Ledford, and Pauline Winbush shovel the first scoops of dirt at the ceremonial groundbreaking for David G. Millen Intermediate. 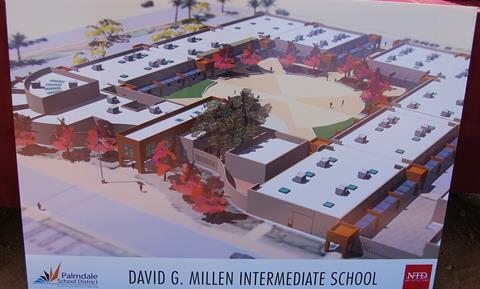 PALMDALE – Palmdale School District officials held a ceremonial groundbreaking Thursday morning for the new David G. Millen Intermediate School. “This is a dream come true, today is a real celebration,” said Palmdale School District Board President Sandy Corrales-Eneix. Corrales-Eneix, Palmdale Mayor Jim Ledford, Interim Superintendent Pauline Winbush, and Michael Antonovich’s Field Deputy Norm Hickling gave brief remarks at the groundbreaking ceremony. The 97,000-square-foot campus will include 41 teaching stations and eight main buildings. The new campus will be located on 16 acres of land at 39221 22nd Street West in Palmdale. When completed, the 97,000-square-foot campus will include 41 teaching stations and eight main buildings, according to Al Tsai, Maintenance & Operations Administrator for Palmdale School District. Actual construction on the projected $34 million campus will begin in late December/early January, and the campus is slated for completion in August 2015, Tsai said. “It’s about an 18-month construction timeline,” Tsai said. The project is funded by monies from Measure DD. The campus is named after David G. Millen, a 29-year veteran of the Palmdale School District. Once completed, the new campus will house students from Juniper Intermediate and from the David G. Millen Intermediate currently located on the back side of Summerwind Elementary. “So you will have probably 1,200 students come opening day at this particular site,” Corrales-Eneix said, adding that the new state-of-the-art facility will be in a prime location. Millen’s widow, Sharon (left), and stepdaughter Vicky Vogel (right) attended the ceremony. Thursday’s ceremonial groundbreaking also served as a tribute to the school’s namesake – renowned educator David G. Millen, who succumbed to Lou Gehrig’s disease in 2004. 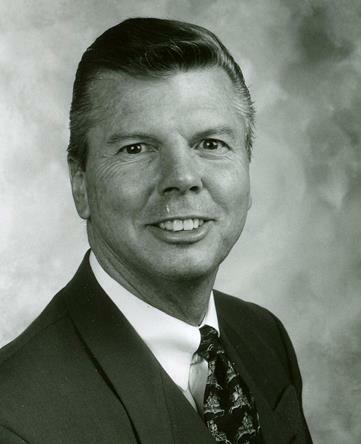 During his 29 years with the Palmdale School District, Millen served as principal at several schools, influenced hundreds of educators and was a coach and mentor to dozens of leaders. “There is not a day that goes by where I don’t think to myself, ‘what a powerful, positive influence, David G. Millen…’ he is a great man and a great friend,” said Bob Rodrigo, who was assistant principal to Millen at Cimarron. Millen’s widow, Sharon, attended the groundbreaking ceremony. 14 comments for "Groundbreaking ceremony for new David G. Millen Intermediate campus"
I live on 23rd west and now get a beautiful view of fences and in a few years noisy kids. ( sarcasm) I think it’s funny how that land was zoned for housing but the PSD does whatever they want. It is a sad fact that the Palmdale School District and the city of Palmdale failed to notify the impacted citizens that a new school would be built in their back yards. In this area we already have the negative impacts of Highland High and will now have this school built in our area just one block from Highland. The school representatives allege that they notified the impacted community. They allege that they have held at least five PUBLIC meetings over the last few years. They state in the board meeting minutes that NOT ONE impacted citizen voiced any concern over the project whether it be in person or through written communication. This board basically condemned privately owned property to obtain the land they needed and then ran through the approval process with no input from the homeowners in the area. These elected officials are suppose to represent the community, not trample their rights. I recently visited many of the schools managed by the Palmdale School District. Many of these schools are not maintained in a condition that make them an asset to the local community. I would argue that in many cases, these schools are detrimental to the local homeowners and property values. If you would like to hold officials responsible for maintaining your neighborhoods schools in a satisfactory manner accountable you can go to the Palmdale School District website and Download a form called the “Uniform Complaint Procedure Williams settlement Form for Education Code Section 35186 Complaints’. Education Code (EC) Section 35186 created a procedure for the filing of complaints concerning deficiencies related to instructional materials, conditions of facilities that are not maintained in a clean or safe manner or in good repair, and teacher vacancy or misassignment. The complaint and response are public documents are provided by statute. If your local school in not maintained in a condition that is an asset to our children and our community please take advantage of this process. The school board minutes state that they have not received even one complaint using this process in a least a couple of years. I understand that the Boards tackle many difficult issues but that does not give them the right to fail to be responsible for maintaining our schools in a satisfactory condition. It does not give them the right to be a bad neighbor to local homeowners. Getting back to the issue of the new David G Millen Intermediate school I would ask and homeowner in the vicinity of the school to share their concerns with the PSD Board as well as our elected city officials. Are you serious, there is a new school in lake la….brand new, as a matter of fact, it was finished two years ago, there are schools that are falling apart, and there building another school, why not fix the schools we have, bring back some of the programs the schools have lost, instead of spending more millions on a new school…this is a little backwards..and bs…….. I watched the TWNews segment. PSD you should never allow Carol Stanford to speak on live TV. Did anyone besides me catch her very confusing statement? Whew! Still SMH! Carol Stanford shouldn’t be allowed to speak anywhere. We are all tired of hearing her stories of when she was a teacher. She has nothing better to say. I feel sorry for the kids that sat through her jibberish. Can you read this Carol? Your ride is OVER!! Go buy health insurance like the rest of us!!!!! David G. Millen was a great man! It’s a damn shame that his legacy has become a pawn in the PSD political shenanigans! He would have been a Superintendent like no other! How in the hell are they proud to be spending money on a “new” school, when they have schools that need repairs?? Why are they proud to build a state of the art school when desert rose, tumbleweed, desert willow, manzanita, and other schools are falling apart? What about building lockers for the junior high kids to use in the hallways, instead of having to carry backpacks that weigh over 20 lbs everyday? What about building decent P.E. locker rooms? Where the kids can have their own locker? Kids currently have to carry a lock and their p.e. clothes in a separate bag everyday because they don’t have their own locker. This is at desert willow intermediate. How about allowing 6th graders to celebrate their culmination at the end of the year? Gallizzi got rid of this practice by saying that kids should only celebrate 8th grade culmination. Yet he is celebrated as superintendent of the year for running the district to the ground!!! 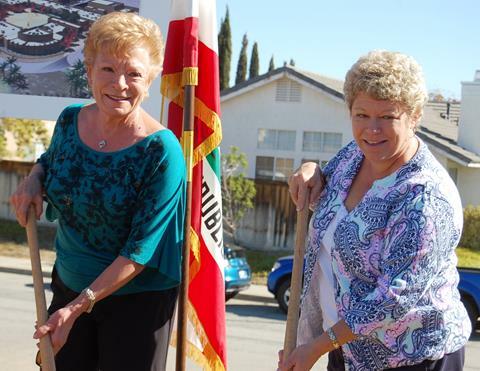 Carol Stanford only cares about keeping her insurance with palmdale school district. She doesn’t care about the kids!! Sandy only cares about making connections to keep her husband employed on the board of the aerospace academy. She needs to GO!!!! Ferrin is rude, and threatens people he doesn’t like with beating them up. Whoever backs these people is either in their pocket, or lives in la-la land. Who doesn’t see what these people have done to this district? and Bo Bynum? Where is he? He’s another rubber stamper. His seat is up next year..stayed tuned people. This is not over. The RIDE is over for them, WE THE PEOPLE voted them out as PSD Board members. I thought the district was too poor to pay its employees because enrollment was falling. Now they’re building a new school?? Huh?? Something ain’t right. So, why are you surprised that they are actually spending money on what the approved bone measure specified they spend the money on? We’ll here is our city spending money they don’t have. I guess we will see another bond to pay for this and add another 10 years to psd cfd 90-1. Have you taken a look at the last two schools they built. They can build them but not able to maintain them just take a look at Barrel Springs School landscaping. I wonder what the hallways look like.